April 13th, 2019 was the “Grande” opening of the Neon Sign Park in Casa Grande, Arizona. Next time you are on your road trip through Casa Grande visit the fantastic Neon Sign Park. The evening started with a welcome and dedication ceremony. 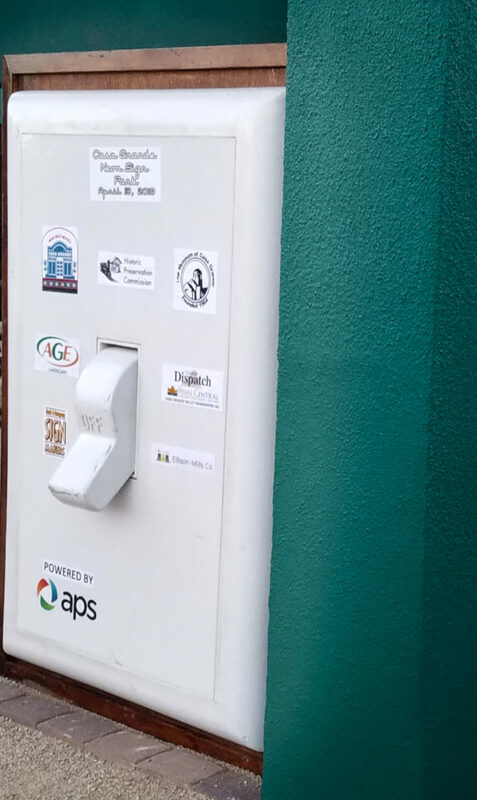 We learned that Casa Grande was one of 25 cities nationwide to compete in an online voting competition. They won 2nd place earning a grant for $144,000. 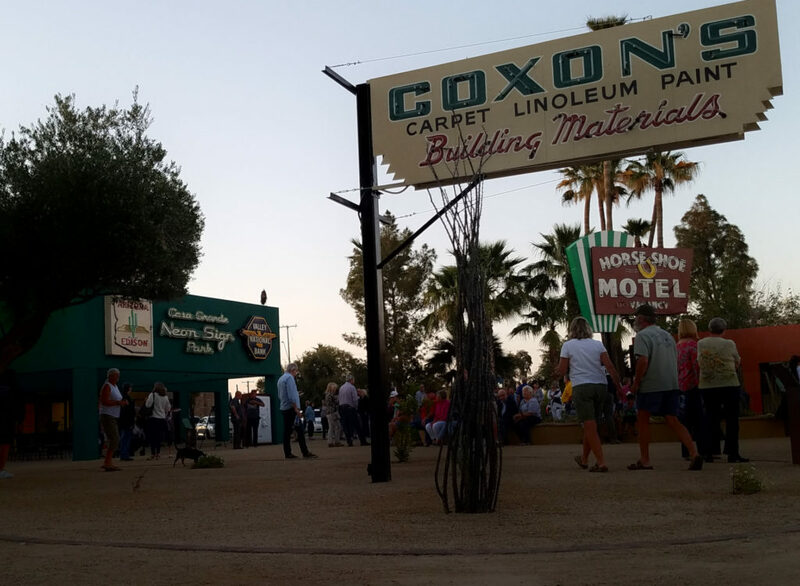 The grand paid for 14 vintage neon signs and the landscaping for the park. There was a very large light switch that was made for the event. When it was time to flip the switch, the Mustang Car Club revved their engines to the song “Mustang Sally” played by the DJ for the event. Next, the light switch was turned on and one by one each of the neon signs turned on. 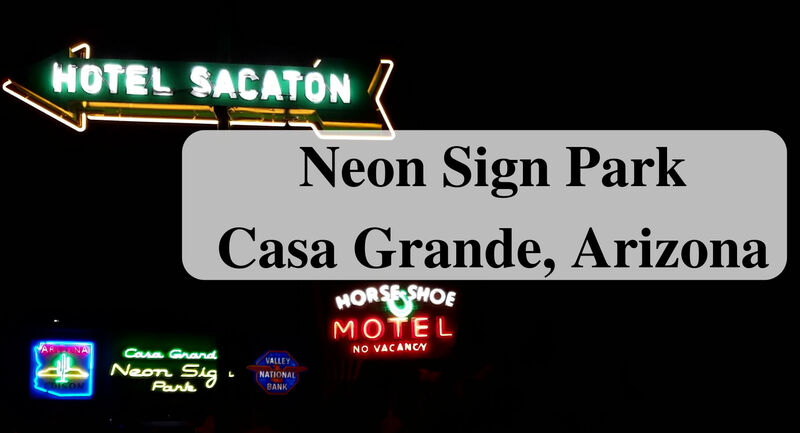 When you are passing through Casa Grande visit the Neon Sign Park located at 408 N Sacaton St.
What is your favorite neon sign that you have seen? We agree! The city did a great job with the concept. What a cool concept! Is there a fee to get in to see these signs? It is a free park. No fee. Go and enjoy. It was fun reading the history of each sign. I have never heard of this before. It is pretty cool. I need to see if we have anything around here like this. Yes, and then let me know where it is if you find one. I love the The Strip in Vegas with all the neon hotels. My fave is the Moulin Rouge in Paris though. The neon windmill is really neat. Those are great signs too. I have seen the signs in Las Vegas. I have not seen the sign (in person) for the one in Paris. What a fun novelty place to visit! It is a fun place. The benches are neat too. OH! This is on my list of stuff to do!!! I think it’s so cool! This looks like so much fun! I would love to see it for myself one day. Love it. Have you been to the Neon Graveyard in Las Vegas? Same kind of concept. I haven’t been to the one in AZ but have been to the one in Vegas. We have not been to the Neon Graveyard in Las Vegas. I am excited to check it out. Thanks. Well that’s different. It looks really cool! Different is what attracted us to the event. People are creative. I don’t know why but this reminds me of Pixar 😀 I love Pixar. I love all the neon signs in Las Vegas. Some of them are very iconic like the Cowboy. Thanks for sharing this cool experience. Yes, the neon signs in Las Vegas are amazing. Who knew there would be a park dedicated to Neon Signs? So Fun! It was very interesting and taking photos at night was really fun. I love finding unique places like this!! I drive to Arizona to visit my dad all the time, I am going to have to detour next time and check this out! Wonderful, you will enjoy the park. Wow what an interesting event! The neon sign park is cool! It was a new type of park for us to visit.